Lucy J. Madison is a novelist, poet, and screenwriter born and raised in Connecticut. She received a Master of Arts in Liberal Studies with honors from Wesleyan University, receiving the University’s Rulewater Prize for her thesis project on women’s basketball. Her work has appeared in many magazines, literary journals, and anthologies. She is a member of the Authors Guild, Romance Writers of America, Rainbow Romance Writers, Golden Crown Literary Society, and the Lesbian Authors Guild. Lucy is currently working on several feature film scripts and two new novels. She resides with her wife of 17 years in shoreline CT and in Provincetown, MA along with their beloved pets. In the Direction of the Sun is a lesbian romance novel written by Lucy J. Madison. Alex McKenzie has taken leave from the elementary school where she teaches English and embarked on a solo through-trip of the Appalachian Mountain Trail. Her sister and mother think she's taken leave of her senses as well, and sought to discourage her, but Alex needed this. She was hurt and confused over the abrupt and painful ending to her fairy-tale romance with Cate Conrad. From the moment Alex first saw the free-spirited artist and temporary art instructor at Burr Elementary School, Alex knew Cate was the one. She had been so careful not to get involved too quickly, but Alex had fallen deeply and helplessly in love. Cate was terrified of commitment, however, and Alex's somewhat clumsy attempts at getting Cate to understand the intensity of her feelings frightened Cate even further. While Alex was hiking, Cate was the artist-in-residence in a rustic oceanfront cabin in the sand dunes of Race Point, Provincetown. She had won the lottery for a three-week stay in the prized dune shacks, but her canvases remained pristine white and untouched. While she had run away from Alex, who threatened her independence and need to feel free to roam, she couldn't get past the memories of their relationship. Lucy J. Madison's contemporary lesbian romance novel, In the Direction of the Sun, is filled with action, adventure and gorgeous nature descriptions as Alex and Cate learn to live without each other. I'm an avid fan of Appalachian Trail memoirs and fiction, and loved experiencing the trail through Alex’s eyes. I also agreed wholeheartedly with her that it should be an experience savored fully, and that 10 miles a day made for a much richer experience than the grueling 16-20 mile days many through-hikers undertake. The evening she spends with some friendly fellow hikers, which is when she finally gets her own trail name, Moonstruck, is brilliantly described and is a turning point for Alex in her Appalachian Trail metamorphosis. With each step she takes, you can sense her evolution into a strong, introspective and confident woman. Madison's story moves back and forth in time to show the reader the full history of each of her main characters, as well as including the letters each writes to the other. Along the way, you can sense how each was affected by the romance, and how the time spent afterwards, combined with their analyses of what was special and what went wrong, contribute to their transformations into their best selves. Madison lets her characters pull no punches -- we see the rage, frustration and aggression Alex expresses on being rejected and can sense Cate's fear of rejection and commitment which has closed her off to the possibility of a loving relationship. All the while, each of them are aware of the passage of time as the thirty-somethings come to realize their existence in this life is a finite thing. Her nature descriptions of Cate’s sailing adventures and Alex’s Appalachian Trail hike are first rate and make this a must-read for anyone interested in adventure fiction. 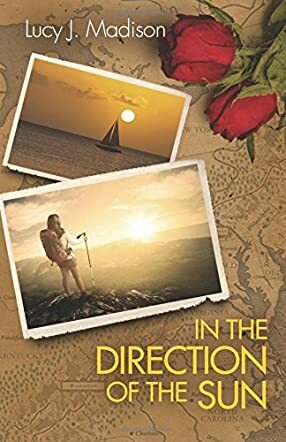 In the Direction of the Sun is a brilliant character study and an engaging and powerful romance. It’s most highly recommended.